World War II is over and the victors govern the country. During the German occupation Storm Steinset was a double agent for the Norwegian Resistance Movement, and his mission is still covert; he gave an oath never to reveal his true activities during the war, even in peacetime. This means he must live with the fact that his colleagues in the Oslo Police Department think he was a Nazi. When several policemen who worked for the Nazis during the war were found dead of the same torture methods they themselves used during the war, Storm realises that he too must be on the killer’s death list. At the same time he has been assigned to investigate the case. Storm’s partner is the police force’s youngest deputy, a rising star Robert Rødberg who dreams of becoming a hero – and despises people like Storm. In their hunt for the killer Storm and Robert delve into the secrets of the innermost circles of power in the formerly occupied country. There is the threat of a new war breaking out, a war in which secrets from the past war can get you killed. I started Warrior’s Peace without too many expectations. I got it from Aschehoug Publishing House, and it surrounds my favourite topic book-wise, World War 2, so I thought I would give it a go. I started reading it on the train back home last week and before I knew it I was 200 pages in. Just like that. Again, I struggled with figuring out who was behind the murders and pulling the strings throughout the whole story. I was very shocked when I discovered who was behind it all. The way Gallefoss hides his murderer behind all the different perspectives and many characters is brilliant. It threw me completely off, which makes it all the more fun, even though my ego gets a bit cracked when I can’t figure out the plot, haha. In many ways, this story is like a boiling frog. That sounds strange I know, but when you put a frog in a pan, turn the water on, and it starts to boil the frog won’t notice that it is being cooked alive. A terrible analogy I know, but in this case, it is very explanatory. I feel like the main character, Storm, is the frog. Before he knows it he is tangled up in everything that is messy, and as readers, we are tangled up with him. While reading we get the sense that there is a lot of hidden action going on in the book, and as the story reveals itself we get to know all the secrets! Personally, this book is historically interesting for me since I’m from the Oslo area. 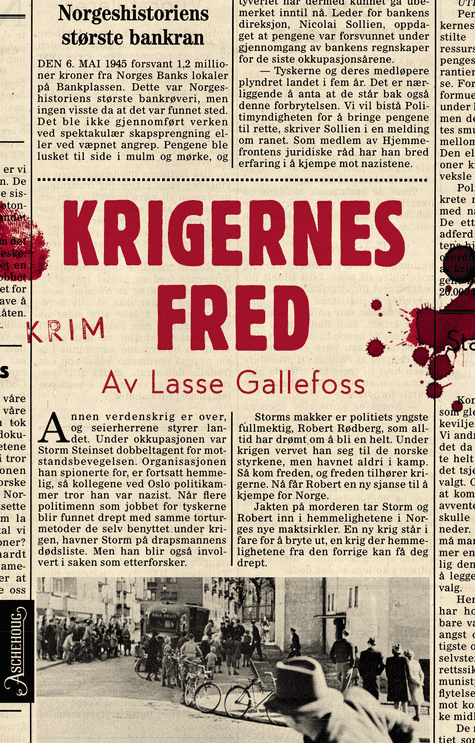 I know the author is inspired by real-life Oslo post-war time and I love to read about it! I don’t know too much about Norway in post-war times, and when I say post-war I mean directly after the war ended. You start to wonder if there was a lot of secrets that were shuffled under the carpet when the war ended. I can be a bit macabre, and I find torture methods somewhat fascinating. There is a lot of torture talk in this book, and I’ve always wondered what makes people do this to one another. The psychology of it all and how people can be so cruel. For my Norwegian readers who are interested in the war, there is a brilliant reference list at the back of the book! I’ve heard about a few of the books that were listed, and read a few of them, while some of them are still resting on my shelf. Or in boxes right now, since my parents are moving. Warrior’s Peace has everything that will make this an awesome reading experience. There is murder, spies, secrets, torture, and twisted people! It hasn’t been translated yet, but I hope it will be translated soon so all of you guys get the chance to read it! I really enjoyed reading this book, and I’m getting more and more excited about crime novels! Thank you so much Aschehoug Publishing House for sending me this copy! The cover is one of the coolest that I’ve seen in a while, so take a sec to appreciate it!